Comet Lovejoy (2014 Q2) is now visible in the night sky, and while you’ll need binoculars or a low-power telescope to see it best, the perfect window of opportunity to see it for yourself is starting now! We’ve heard from some readers that they’ve had some trouble spying it, but photographer Brian Moran has snapped the perfect picture to show you EXACTLY where to look for the comet. All you need to do is look for the easy-to-find constellation of Orion, and swing your eyes to the right (about 20 degrees) and up slightly up. Brian said he was having trouble finding Lovejoy, but perhaps it may have been because he was looking a little too close to Orion. “Orion is a great frame of reference, but all of the photos I saw online made it seem like it was closer to Orion than it actually is,” he said. Comet Q2 Lovejoy is currently shining at 4th magnitude, and if you’ve got a really dark sky, you may be able to see it with the unaided eye. as our David Dickinson explained, this comet is now entering “prime time” evening sky viewing, as it is visible over the southern horizon at around 9:30 PM local time this weekend, then 8:00 PM on January the 15th, and just before 6:00 PM by January 31st. Tonight (Thursday, January 8) we’ll have a “two-hour window of darkness between the end of twilight and moonrise for those of us in the world’s mid-northern latitudes. Each night after tonight the Moon rises nearly an hour later,” said Sky & Telescope’s Alan MacRobert. Finder chart for Comet Lovejoy, C/2014 Q2, during January 2015. The dates are in Universal Time; the ticks are at 0:00 UT (7:00 p.m. on the previous date Eastern Standard Time). Click on the image for larger, print-friendly black-on-white PDF, courtesy of Sky & Telescope. 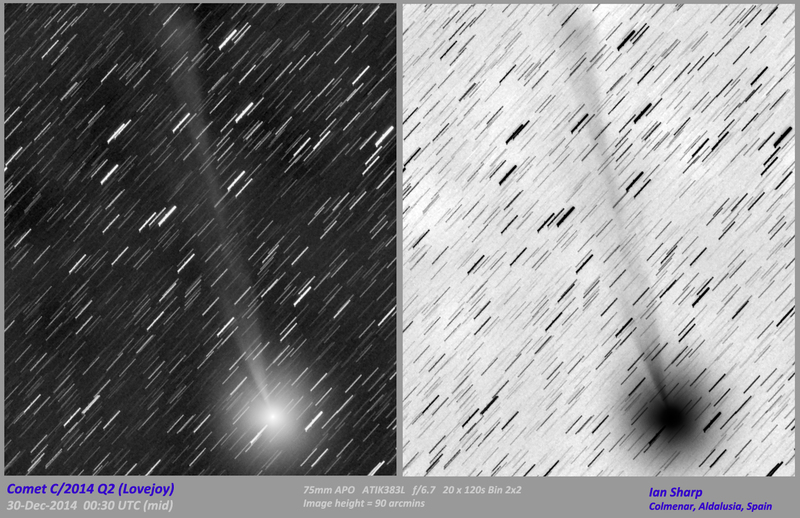 While C/Q2 Lovejoy passed closest to Earth yesterday (January 7) at a distance of 0.47 a.u. (44 million miles; 70 million km), the comet should remain at about the same brightness as it crosses the sky into Taurus, Aries, and Triangulum, higher and higher in early evening. It will pass 8° west-southwest of the Pleiades on the evening of January 17th. 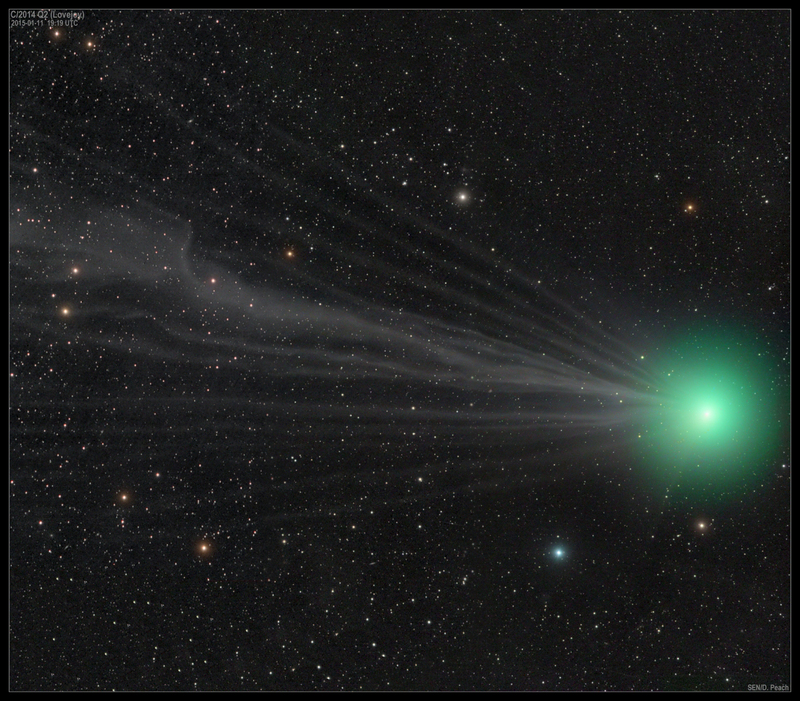 Here are some great images of Comet Lovejoy taken by Universe Today readers. Be sure to check out our Flickr group for more great images! We have nearly 1,500 members and new photos are added every day. And if you take an astrophoto, join our group and submit your photos! We may use your image in an upcoming article! A wide-angle shot of Comet Lovejoy 2014 Q2 above snow-covered trees. Taken as it neared Orion on January 6, 2014. Credit and copyright: Marion Haligowski. 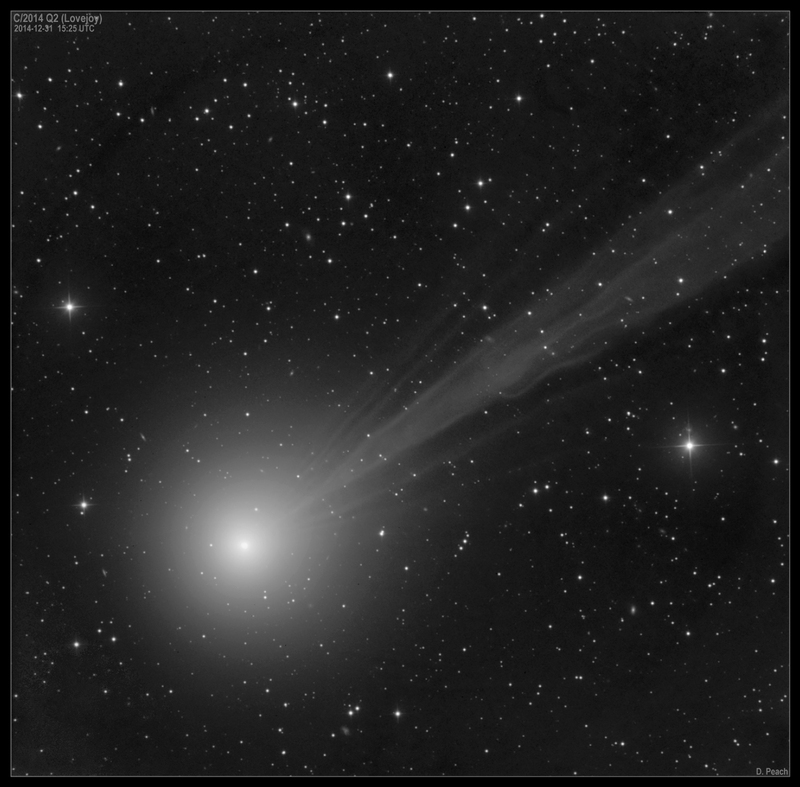 C/2014 Q2 Lovejoy on 7th January 2015. A couple of satellites managed to sneak in the image, too! Credit and copyright: JP Willinghan. Comet C/2014 Q2 Lovejoy Passes Messier 79 Narrowfield C False Color, taken on Dec 29, 2014, from New Mexico Skies using a 43-cm CDK telescope and STXL-6303 camera on a PME II mount. Credit and copyright: Joseph Brimacombe. A monochrome image of Comet Lovejoy (2014 Q2) taken on December 31, 2014. Credit and copyright: Damian Peach. Comet Lovejoy, as seen on December 29, 2014 at around 12.30AM SGT from Singapore. Also visible is spiral galaxy NGC1886, seen to the left of the coma. Total exposure time is 12 minutes. Credit and copyright: Justin Ng. Comet Lovejoy as seen from Aldalucia, Spain on December 30, 2013. Credit and copyright: Ian Sharp. Comet Lovejoy Passing Globular Cluster M-79. Credit and copyright: Greg Redfern.